In many cases, foreign workers in Kuwait find that they’re able, for the first time, to save part of their income for the future. You should therefore investigate the best ways to obtain (safe) returns on the money invested and (legal) ways to avoid tax. Before leaving your home country, declare your trip to your home tax authorities. Provided you establish non-resident status in the Gulf country in which you’re working, you will normally be outside the remit of your home country’s tax regulations and will therefore minimise (or avoid altogether) tax penalties. If you keep your home bank account open in order to pay expenses (e.g. related to a property), the money that you remit to this account should be kept to a minimum. If you’re also earning income in your home country (e.g. from property rental), you may be liable for tax on this and you should check with your home tax office or a financial adviser. US citizens must also pay home tax on their overseas earnings. An offshore bank account may be advantageous if you want to earn interest while keeping funds reasonably fluid in the short to mid-term. An offshore account can be used as a central source from which to send funds to other locations, including an account in your home country. Other attractions are that money can be deposited (and maintained) in a wide range of currencies, customers are usually guaranteed anonymity, there are no double taxation agreements, no withholding tax is payable and interest is paid tax-free. There are over 50 official ‘tax havens’ offering offshore banking, including the Channel Islands (Jersey and Guernsey), the Isle of Man, Gibraltar and the Virgin Islands. A large number of American, British and other European banks and financial institutions provide offshore banking facilities in one or more locations. Most expatriate financial publications, such as Resident Abroad, carry advertisements for offshore banks and their services. 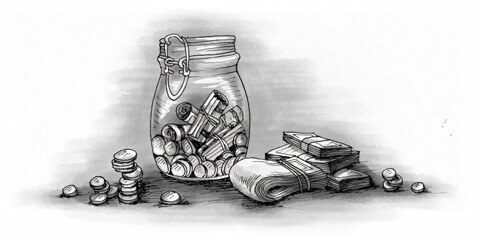 Most institutions offer high interest deposit accounts for long and mid-term savings and a variety of investment plans. Accounts have minimum deposit levels that usually start at around $1,500 (£1,000), with an upper limit of around $150,000 (£100,000), above which you may be able to negotiate a special interest rate. The major disadvantage of offshore ccounts is that there are usually stringent conditions relating to withdrawal periods and penalties for early withdrawals. You can deposit funds with instant access or for a fixed period, for example from 30, 60 or 90 days up to a year or more. Interest is usually paid monthly but can be paid annually, in which case interest payments are slightly higher. There are usually no charges if you maintain the minimum balance in the account. Some accounts offer a cheque book but are likely to impose a limit on the number of cheques that you can issue in any year, after which you must pay charges. Cash or credit cards are frequently offered, usually underwritten by Visa or Mastercard, and these can be used in ATMs worldwide. When reviewing financial institutions and offshore banking centres, your first consideration should be the security of your money. Offshore branches of larger companies are in most cases separately formed companies, with rules and regulations applying to the countries in which they’re formed and operate within. In the event of any difficulties, the parent company is likely to bail out its subsidiary, but might not be legally required to do so. Nevertheless, big is generally best when it comes to selecting a home for your money. The major international banks are hardly likely to fold and you might feel more comfortable with those that you already know. If you’re offered unrealistically high terms of interest, the chances are that they’re just that – unrealistic. However, some of the northern European banks, e.g. those in Finland, offer much higher rates than average, presumably to attract funds, and they’ve been operating safely for a number of years. Many banking centres offer a protection system whereby a percentage of bank deposits up to a maximum sum is guaranteed in the event of a financial institution becoming insolvent (Guernsey, Jersey, the Isle of Man and other offshore centres operate such a protection scheme). You can check the level of deposit insurance offered by the various financial institutions with Moody’s Investor Service or via your financial adviser; you can also verify their credit ratings. All banks have a credit rating, from the highest of triple ‘A’ downwards, and most are happy to tell you about it, particularly if they have a high rating. Ratings just below ‘AAA’ don’t necessarily mean that the financial institution’s status is doubtful. Some people regard savings and deposit accounts as attractive only to the smaller investor. Those with larger amounts to invest, who are seeking greater returns, might consider other types of investment.